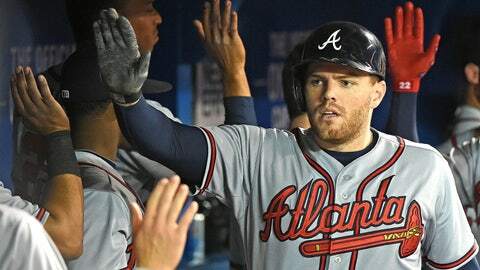 Freddie Freeman has bought into the rebuild. When the Atlanta Braves first decided to go through their rebuild, many fans were skeptical. Then, the trades begun, the Braves hauled in top prospects and people started to believe in the process. One of those believes is Freddie Freeman. "I’m OK with the moves. I’m obviously going to miss Andrelton [Simmons] and Shelby [Miller] a lot. Definitely going to be different not seeing Simba (Simmons) roaming short this coming year. But I hope he continues becoming a superstar with the Angels. The Diamondbacks got top-of-the-rotation stuff with Shelby (Miller). Not looking forward to having to face him. But me personally, this offseason’s moves made everything come full circle. We got a lot of top prospects back in the trades and I’m looking forward to seeing them in spring training. We have some young guys that could be making an impact with us this year, and in my opinion it’s an exciting time to be a Braves fan because I think we are going to be good soon – and for a lot of years to come." The Braves traded have traded franchise mainstays in Jason Heyward, Craig Kimbrel and Andrelton Simmons, in addition to Shelby Miller. In return, they’ve revitalized their farm system — four of the top five top prospects were acquired within the last year, including top 2015 first-overall draft pick Dansby Swanson.